I had a productive run out in Cote St-Luc about a month back. This pile provided most of my finds. My guess is that the garbage was divorce-related, given the presence of a few different wedding photos. The frames were pretty nice, so I removed the photos and sold them at one of my recent yard sales. The little trinket box and frame at top right were made of Alpaca (basically faux silver) in Mexico. 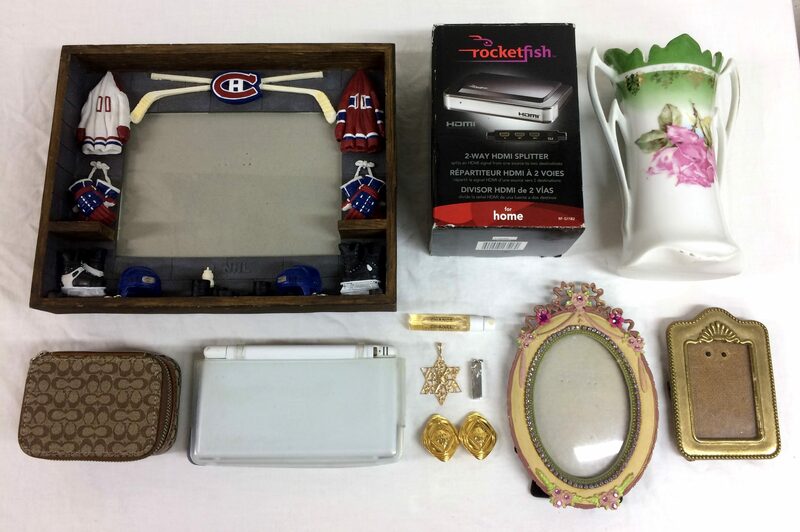 There’s some other nice stuff here as well, including a silver ring (bottom right) that I sold to my mom. I also found a couple American postage stamps. I have no use for them, so I’ll give to the next American reader who buys something! Here’s some more quality yard sale stuff. 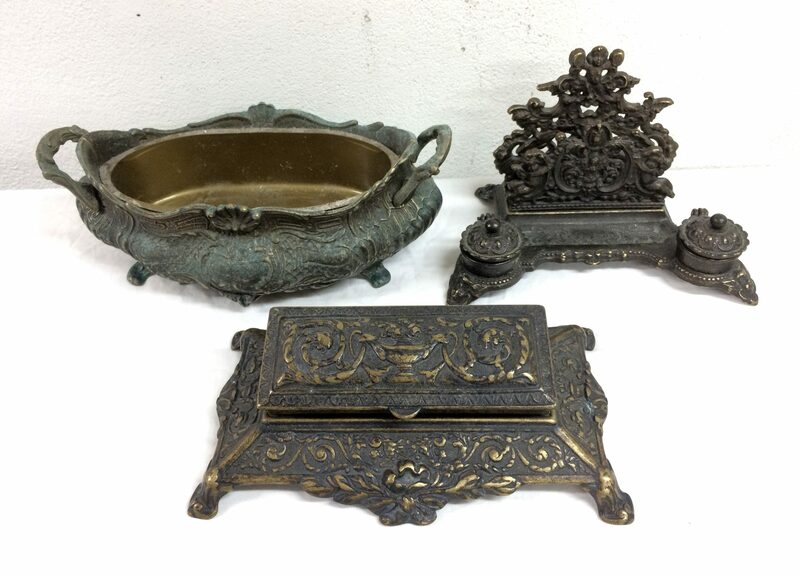 I particularly like that little brass box which looks to be pretty old. 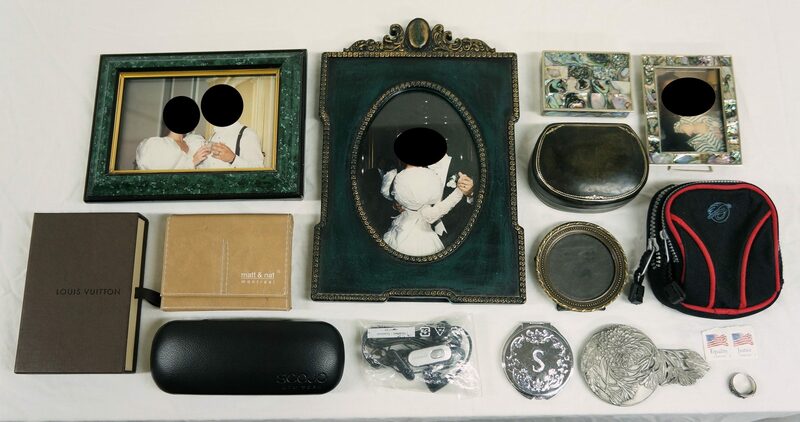 If I remember right that bracelet on the bottom right is sterling silver, and the eyeglasses are Dolce & Gabbana. That Montreal Canadiens picture frame sold for 5$ at one of my recent sales. The Star of David pendant is marked 10k gold. There’s also a pair of Chanel costume jewelry earrings, though I can’t be sure if they’re legit. The stamp box in the foreground had a sticker on it claiming to be an antique, with a price of 65$. I don’t think it was an antique however, it’s more likely that it was made in the 70s or 80s and made to look antique. The main giveaway were the screws and patina, neither of which looked particularly old. Regardless, all these items sold at the yard sale for a modest profit. I also saved a few larger items. 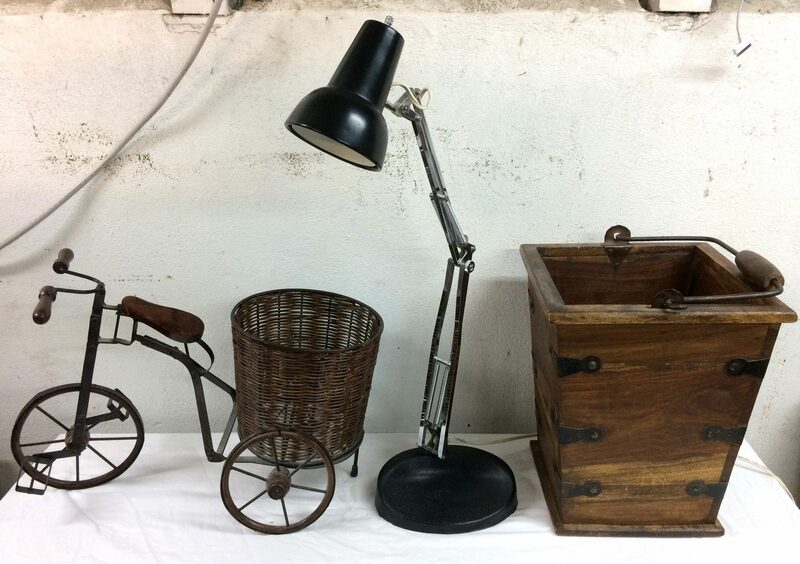 The lamp is nice, made in Norway by I forget which company. Mind the dust, I haven’t had time to give the garage a good clean yet! I checked that spot the two weeks after but found nothing, so I guess it’ll go down as a one-hit wonder. That same night I found a great folding table set just down the road. It had been attacked by some kind of white mildew or mold, but none of the pieces showed signs of permanent damage – I was able to clean it off using soap and water. The pieces were made by Hourd in London Ontario. All were well made, but the folding table, which also extended to comfortably fit the four chairs, was probably the nicest folding piece I’ve ever seen. 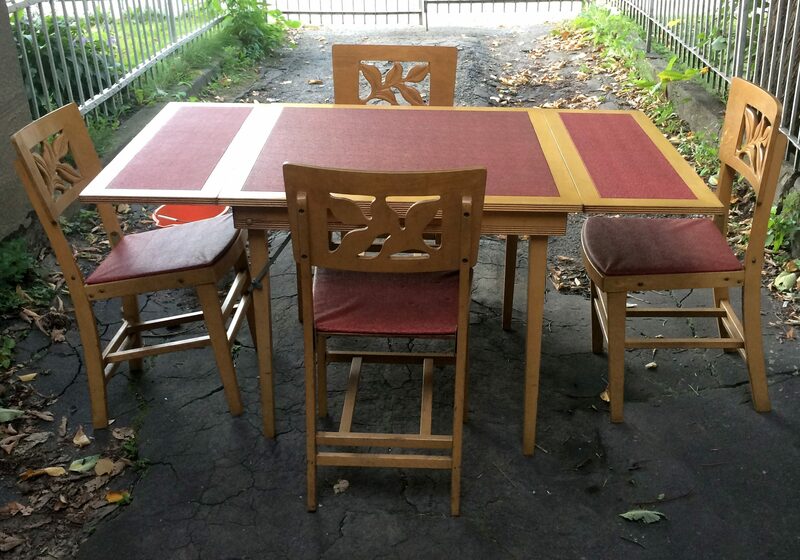 I sold the set to a friend for 100$, which I think is a good price. 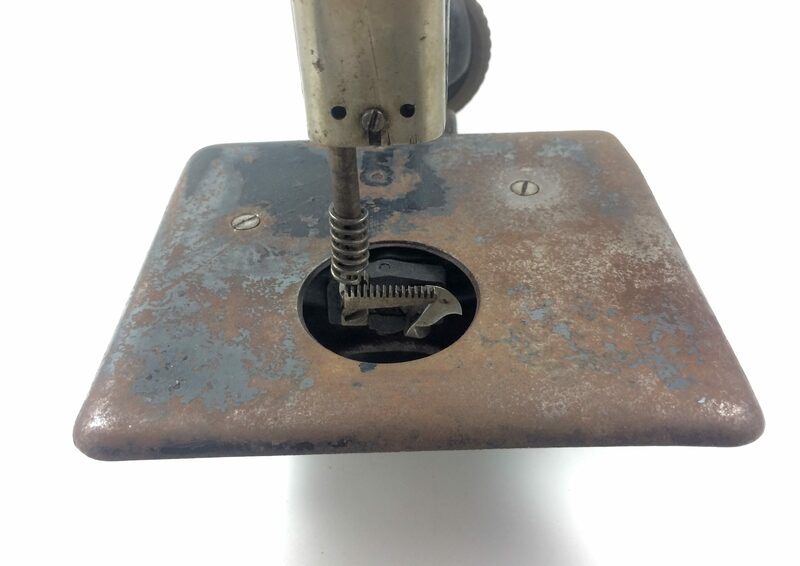 Otherwise, I was hoping someone could help me figure out this little sewing machine I found. The thing that confuses me is that it’s about half the size (maybe 1′ long) of any other old, heavy sewing machine I’ve seen previously. It’s of the hand crank variety, so I expect the machine is close to 100 years old. It has a few numbers on it, but unfortunately I saw no signs of branding. Here’s the throat plate area if that helps. If you’ve seen something like this before, let me know in the comments! You SOLD the ring to your Mother? I know, she insisted on giving me something though lol. I insisted that she at least give herself a good deal. Ha ha! I thought the same thing! 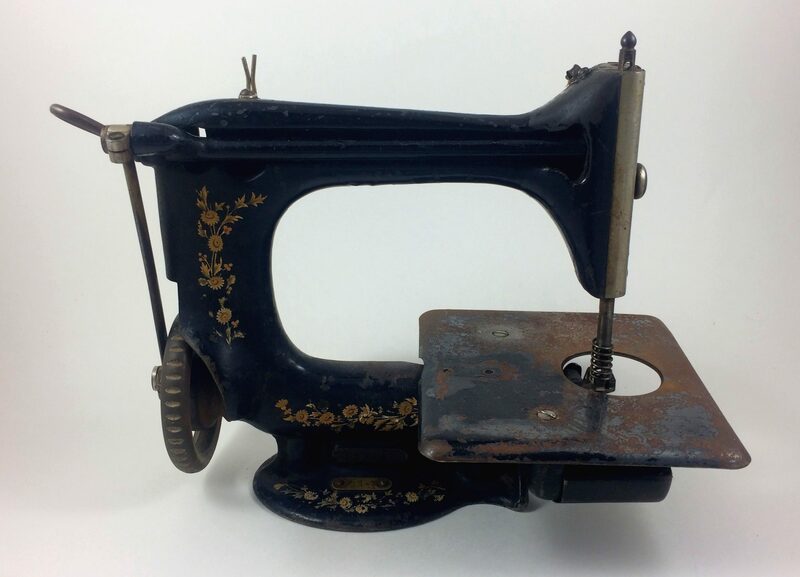 They used to make little sewing machines for children. Could be a child’s sewing machine. How odd. That sewing machine looks like a Singer but without its table. Great finds! It never ceases to amaze me what we’ll throw in the garbage. The photos weren’t that old, I’m guessing mid-1990s so I doubt it. It’s hard NOT to speculate on the the reasons for deposal of such goodies.’Et voila ‘why people are irrate. 1980s on the wedding, I’d say with those dress sleeves. Too bad they didn’t throw out the dress. Iconic for sure. If you still have that blue beaded bracelet, those come from Greece maybe? For protection against the evil eye. It sure is fun seeing your treasures! Thanks for the info, you might be right. I’ve never found a wedding dress, but I expect I will eventually. The bracelet does seem to be an evil eye thing (I googled “evil eye bracelet”) and found some similar pieces. I’ve found several in my time as a trash picker, so they’re common enough. Lol. Yeah, shipping this thing to the UK would be quite expensive. It’s small but still quite heavy. It’s a cute piece, but the paint isn’t in particularly good shape so it’s unlikely to be valuable. Have you sold it? How much are you selling it for? It’s slated to go to my yard sale tomorrow. Given it’s condition, I’ll be happy to get 10$. It’s a cute piece but definitely a project. 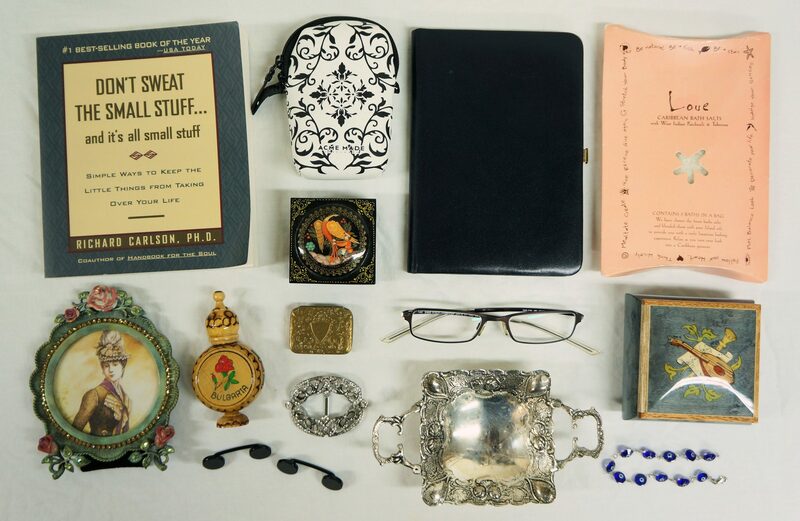 I love the finds in this post,especially the trinket with Bularia written on it.What is that tribket?If you saved these from black trash bags,you deserve special thanks. I think the reader above wants to know about the trinket with Bulgaria written on it.I too am curious.I just find all these finds incredible.People who throw out such valuable stuff are deranged in my eyes. It’s a miniature flask, good for holding a small amount of liquor. I’ve seen similar flasks before, I think people buy them when visiting the country on vacation. That particular one might be a rose perfume bottle. Rose perfume is a common souvenir from Bulgaria. Very inspiring blog.You inspire me to keep my eyes open when walking the streets.Two days ago on Sunday night,I was walking up on Ste.Timothee street from Rene Levesque to Sherbrooke.I found a beautiful beer stein in the trash next to a discarded desk and a pile of trash..I brought it home.Do you ever do Ste.Timothee street just below the Plateau in the gay village? Cool. I don’t go down there very often, maybe once every couple months or so. Haven’t gotten lucky there yet but there’s probably some good trash on occasion. There’s also a lot of scavengers, so I’m less likely to be the first one there for major finds. Do you find more trash in the morning than in the night?You wrote a while ago that you stopped doing night runs and do morning runs these days.I actually scavenge a bit ,but only at night because I do not want to be noticed.Few people even come across my path when I scavenge just after midnight. By the way,I love it that you are writing more frequent posts. It’s hard to say, I find good stuff both times. Some neighbourhoods it’s much better to go in the mornings. For example, in Outremont few people put out trash at night, probably because of local bylaws, so going there at night is mostly a waste of time. Other areas I don’t notice much of a difference. You might miss a bit at night from people only putting their trash out in the morning, but in the morning you might miss a bit because the garbage truck gets there before you. Those factors I think make the night vs morning a bit of a wash in most neighbourhoods. Right now I’m going a combination of morning and evening routes, depending on the neighbourhoods I’m planning on visiting. For some more distant neighbourhoods it’s good to go at night if only to beat traffic – it makes getting there a lot less stressful. Having the garage helps me get my photos done faster, which makes it easier to get blog posts done. I have lot of photos on my computer waiting to be shared, so expect more blog post in the near future! Could be a child’s machine. I have a collection of tiny sewing machines like that. 🙂 They are so cute.